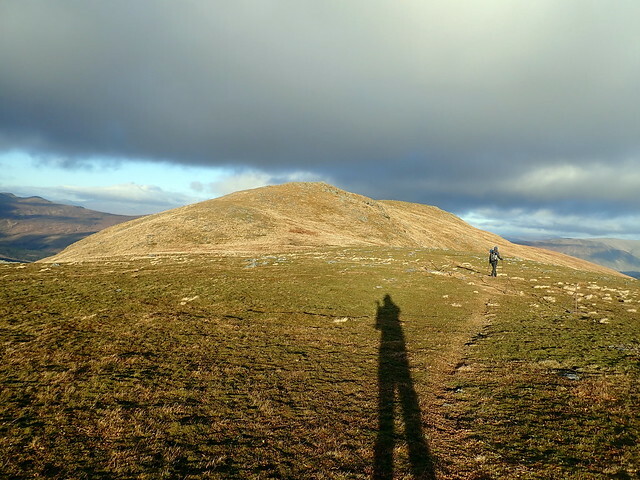 The last weekend of the year - a chance to cram in a few more big hills before the Year of the Corbett begins. So mild - this is late December, right? 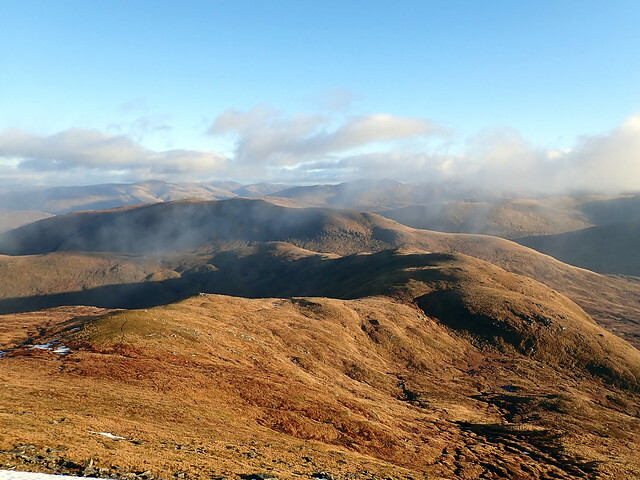 I'd looked at the forecast and recent reports, noticed very little snow around the Cairngorms and put together a wee romp from Linn of Dee over Braeriach, then MacGhui, Mheadhoin and back to Linn of Dee over Chaorainn and Bhreac. Big packs for three days out on the hills. I check the met Office on Wednesday - winds to be strong - OK, out with the lightweight Niak tent and in with the Nammatj which can handle big stuff (but weighs an extra couple of kilos and takes up more space). Then on Thursday afternoon, at 3pm, an hour before we set off I check the forecast again - fog over all the hills for Friday and Saturday. 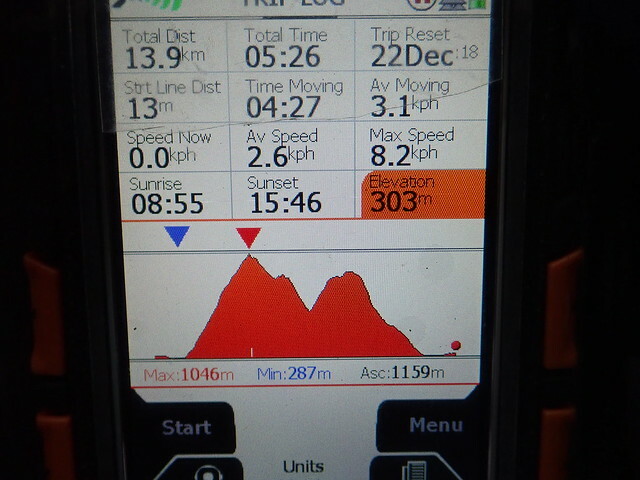 Coping with big winds on the plateau is one thing, but big winds and white out, well I knew when to call a halt. So that leaves me to come up with another venue in the hour before I go and pick Allison up...I really hate having to change plans so late. 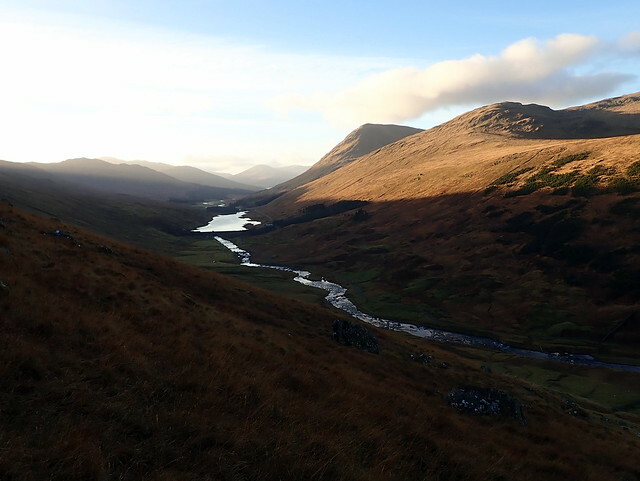 Glen Lyon - OK let's do it. I knew we could camp along the Stronuich reservoir, where we'd been before. Arriving in pitch darkness however, it was easier to put the tent by the car rather than down by the waterside. A quiet evening, only one car going past the whole night. 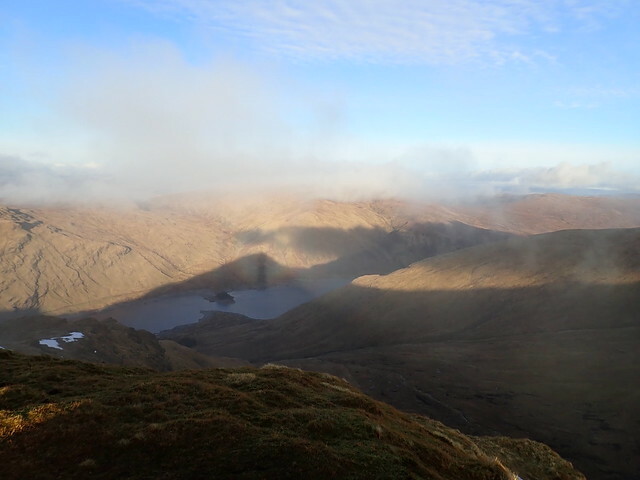 Friday we'd do Meall Gaordaidh and add on the Corbett of Beinn nan Oighreag which we baulked at last time we were up here due to a steep and snowy descent from Cam Chreag. With virtually no snow, that shouldn't be a problem today. 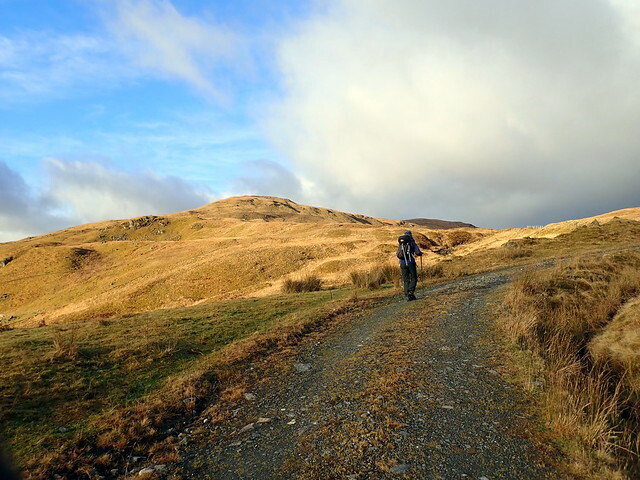 We left the tent beside the car and walked along the road to the small bridge, followed the track for a little before heading uphill round Creag Mhadaidh and onto the northern shoulder of Gaordaidh. 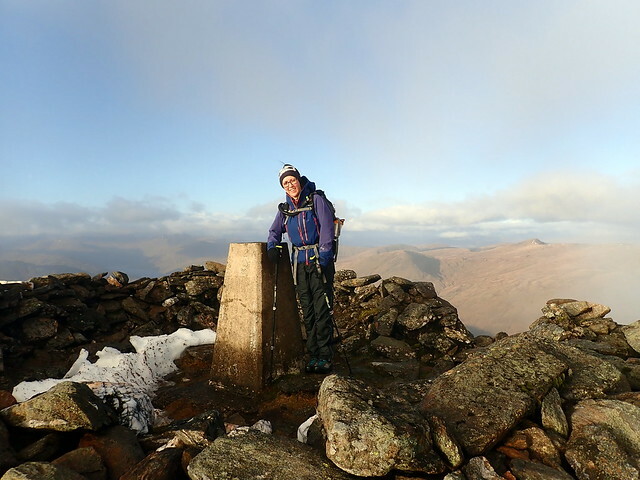 Small ammounts of snow in the eastern facing coire but none at the summit. 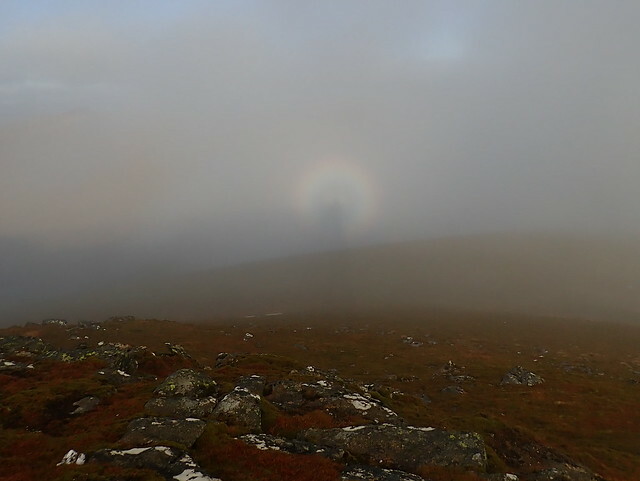 Sun and mist brought out the Brocken Spectres. 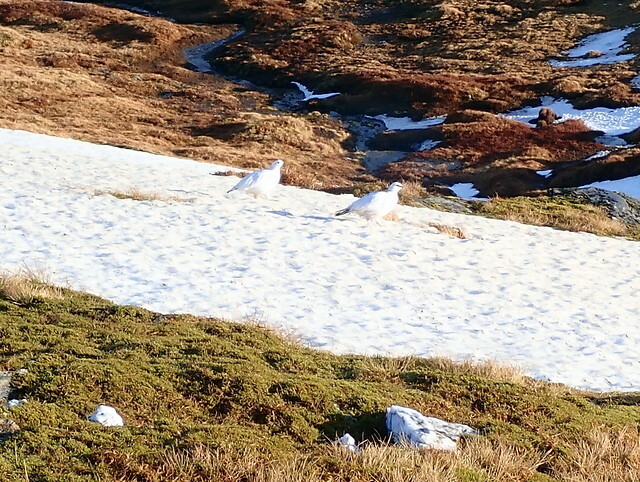 We continued down to Cam Chreag, passing a pair of ptarmigan sitting on an island of snow. Well camouflaged - as long as they don't move off the snow! Last time we'd followed the boundary line on the map to the 815m point before trying to descend to the bealach with Beinn nan Oighreag. This time I decided to cut down the steepish slopes before this which also enabled a more gentle line up Oighreag. 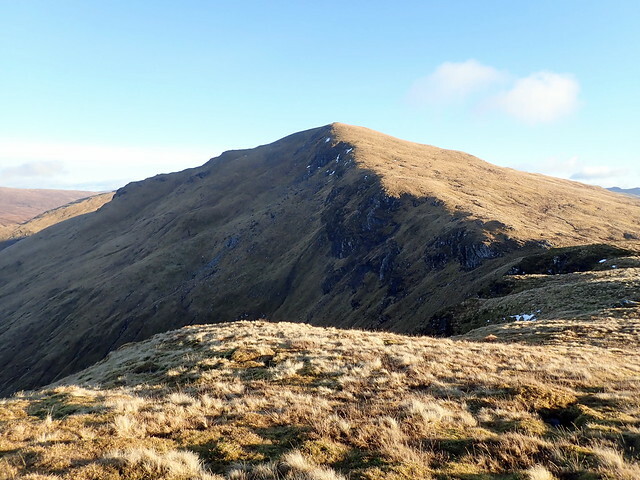 Gaordaidh looked rather shapely with a long narrow line of snow along its northern ridge. 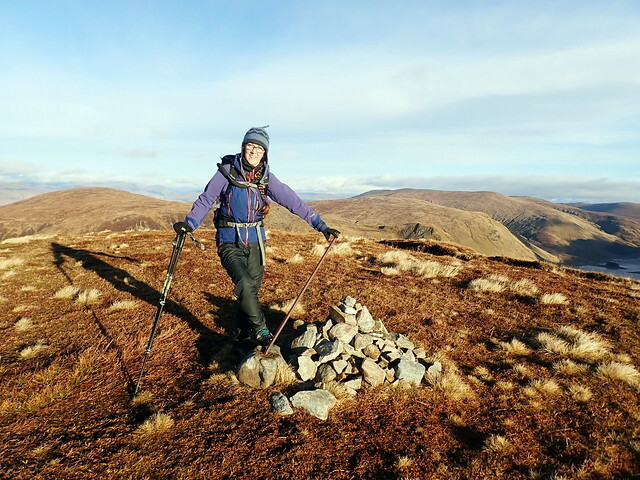 After summiting Oighreag we descended NW, round to the north of the impressive crags of Creag an Tulabhain and back to the road via some sheeptracks. A short day, in pleasant weather. We moved the tent down to the water's edge, where remnants of a large fire by Yahoos scarred the grass. Sat outside in the pale sunlight with some crisps and juice. Time for some reading before an early tea and bed. 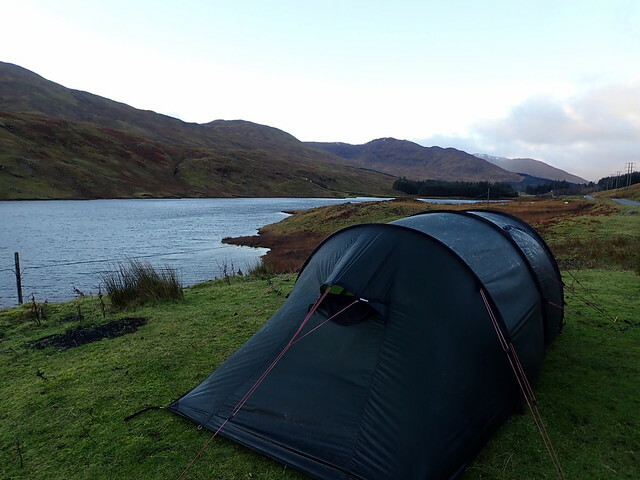 The wind certainly got up overnight - roaring along the water and thumping against the tent. I considered getting up and putting some more pegs in, but they were in the car and I didn't fancy going out in the gale and lashing rain. I could feel a migraine coming on too, but my pills were also in the car. It wasn't possible to sleep much with the wind buffeting the tent around. By 7.30am my headache was painful enough to force me out of bed. After that we lay on til about 9.30 - I knew the wind was meant to lessen a bit after mid-day, so there seemed little point in leaving early. 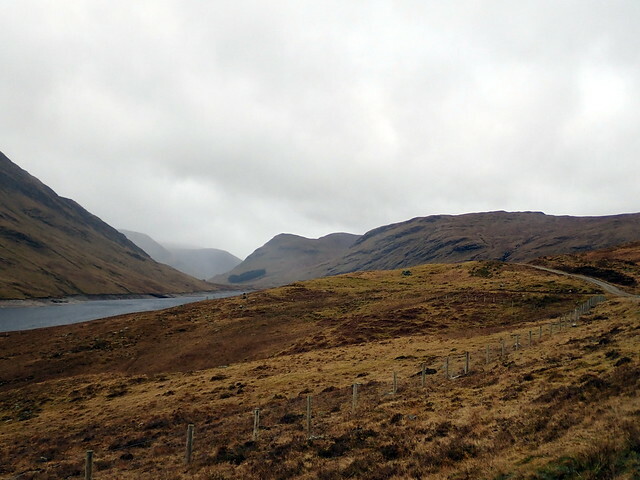 I had originally intended to do Stuchd an Lochain from Loch an Daimh and to include the Simms of Meallan Odhar and An Grianan. 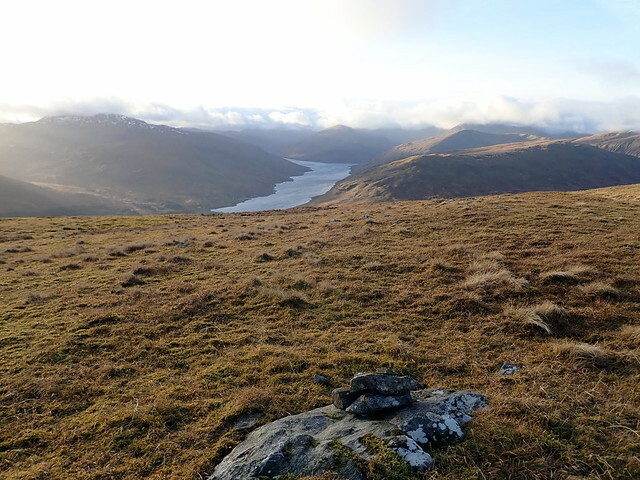 It had occurred to me, looking at the map as we descended on Friday, that we could do the hills from the Loch Lyon side and also add on the Corbett of Sron a'Choire Chnapanich. Which meant that we could leave the tent once again. 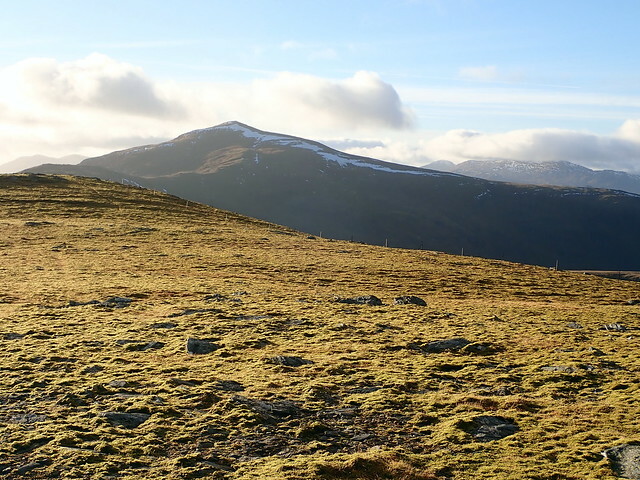 A more ambitious plan would have been to add the other Corbett of Meall Buidhe, but I knew there were more Simms near there and I couldn't remember which - plus it was very windy and we had got up late. 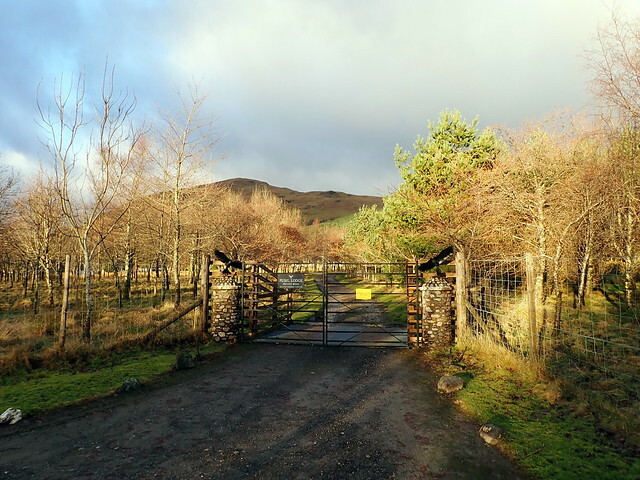 We drove along the couple of miles to Pubil where we parked to the east of the cattle grid and set off through the grounds of Pubil lodge. 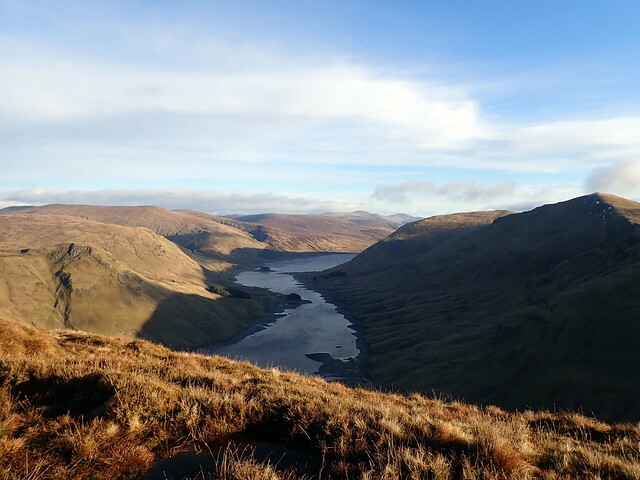 Warm sunshine lit our way as we headed up on the rough track, as far as the dam, thereafter we walked on the boggy hillside. To our right lay Stuchd an Lochain, bereft of snow, indeed there seemed little snow anywhere. 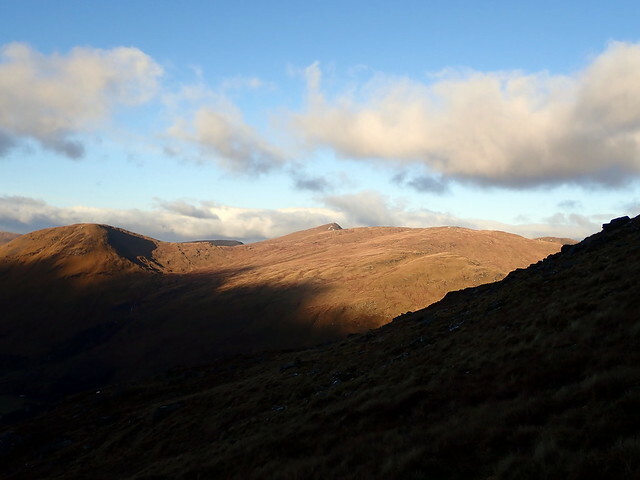 The long back of Beinn Sheasgarnaich held a little, otherwise it was far from a winter's landscape. 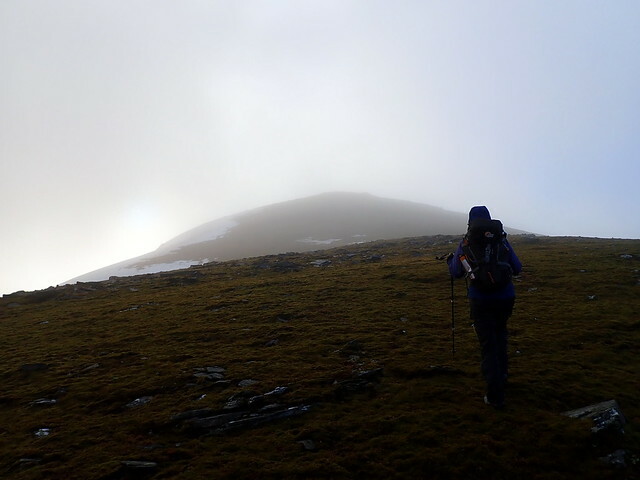 As we nearer the summit of Chnapanich we met a solo walker on his way down, as mystified as ourselves by this weather. 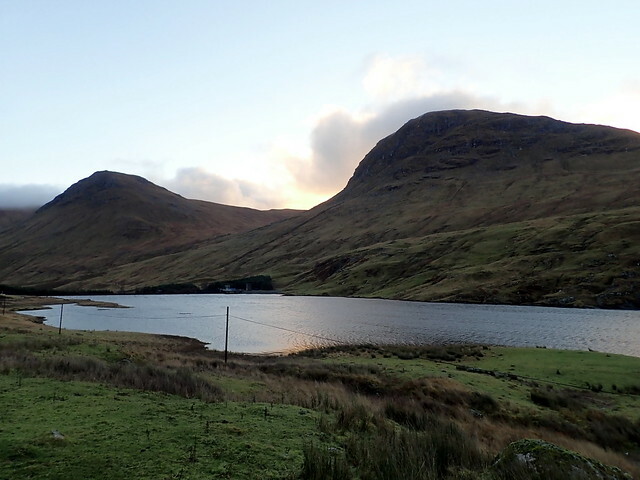 Good views to Loch na Daimh and the hills we'd be doing tomorrow from the top. Down to Bealach a'Mhaim for a spot of lunch before starting up the slopes towards Stuchd an Lochain, following the fence line to miss as much of the boggy ground as possible. 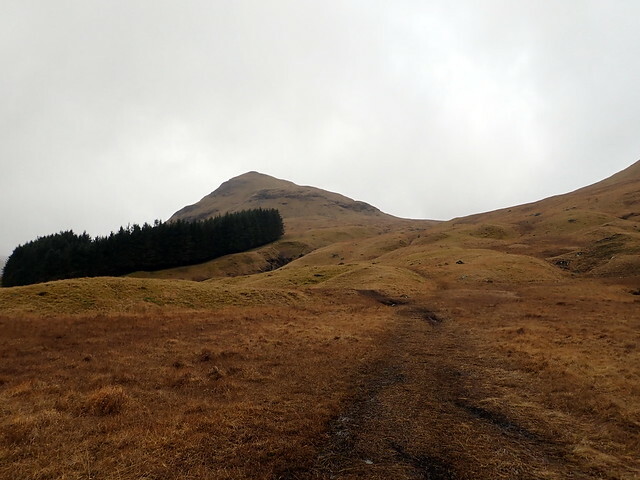 We crossed over Meallan Odhar, dropped down briefly before making our way up to the summit. 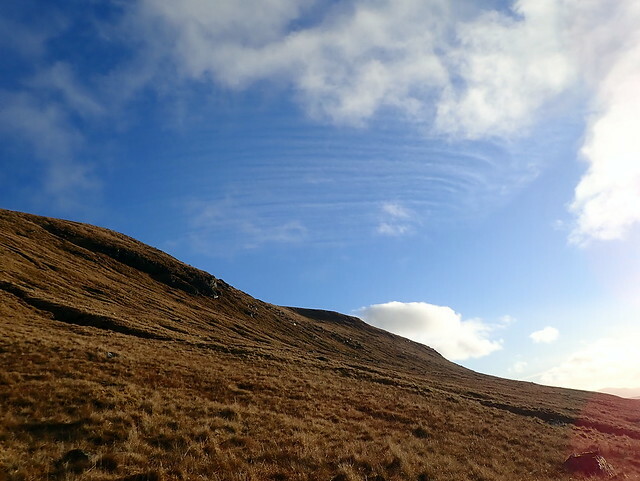 Baby blue sky with a few puffy white clouds - this could be early autumn...From the Munro we descended south towards our final summit of the day, An Grianan (the sunny place) which didn't involve too much hardship. 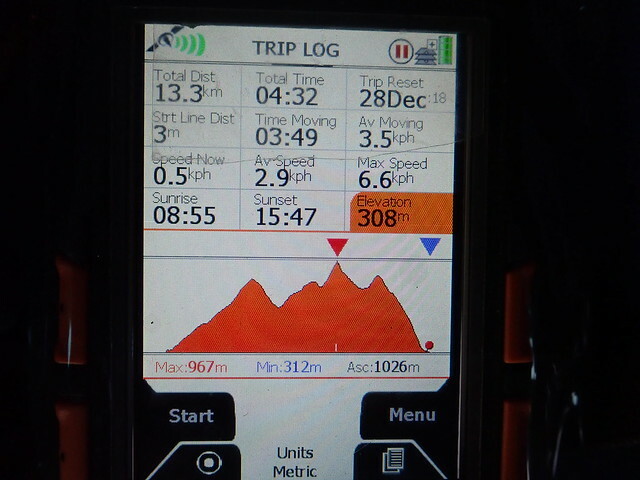 From here I intended to head west til we met the track and descend to the car. However, access to the track is barred by a deep ravine and a small dam - neither of us fancied clambering over that. 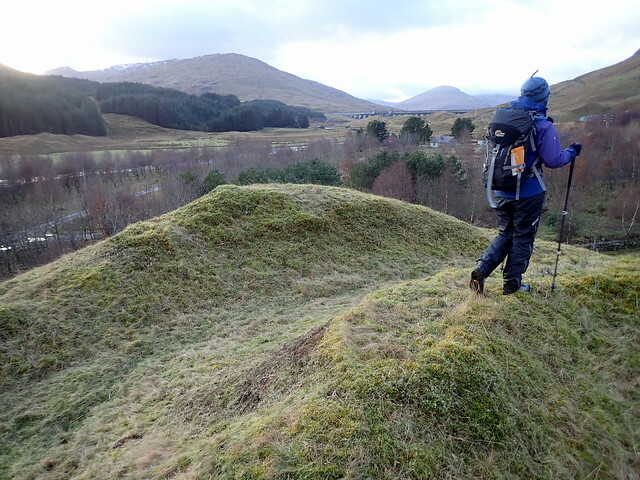 So we continued to follow the Allt Camaslaidh down towards the road, noticing what appeared to be a hill-fort. This wasn't marked on my 1:50k map - we explored a bit and discovered what seemed to be outer and inner walls. A broch maybe? 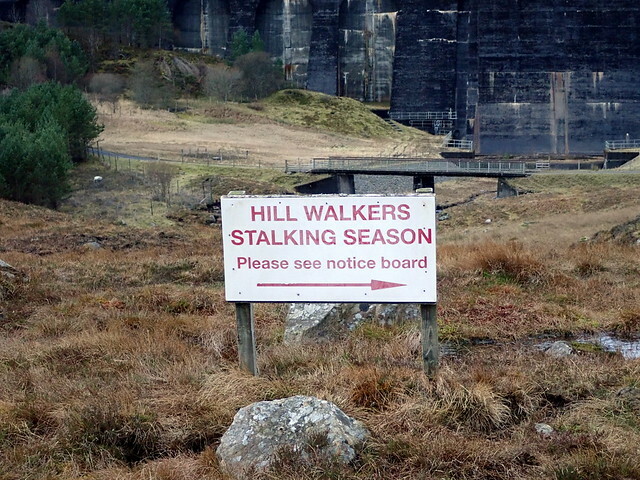 (Researching it on Google suggests it's a natural feature that has been quarried into rather than being a hill fort). 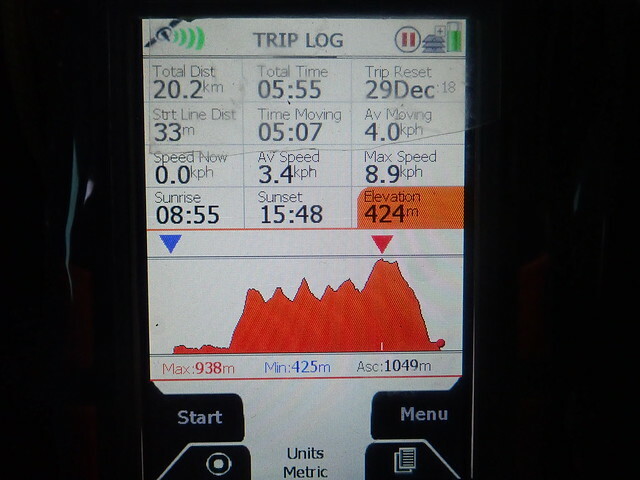 Back to the tent and another short day's work done. More rain overnight, but on waking on Sunday morning the sky is leaden and the drizzle doesn't stop. We dissemble the tent and set off the couple of miles up to Giorra Dam where there's already a car parked. 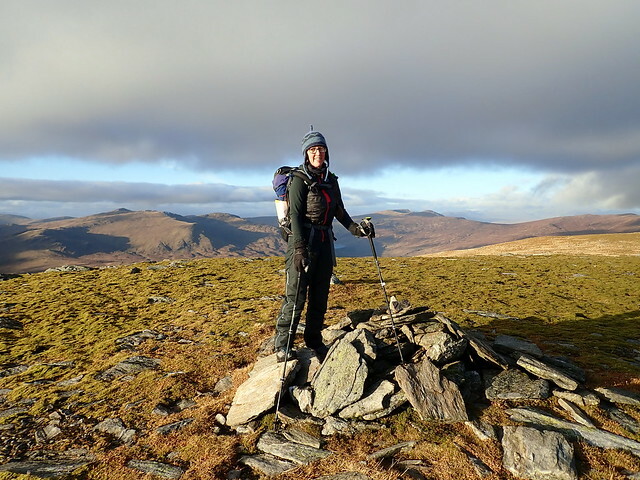 My intention is to climb Meall Buidhe along with four of the western Simms, making this a significantly longer outing than those of the last two days. With the worst weather. Hmmm. 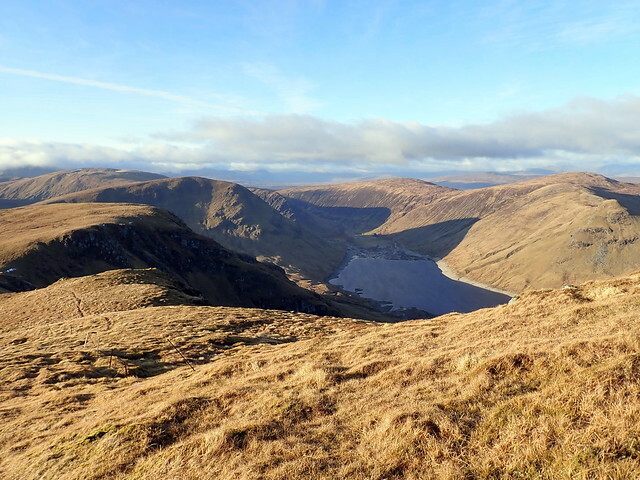 We debate whether to climb Buidhe first or last - it makes more sense to walk along the track to the western end of the loch and do the Simms first, meaning that we are walking with the wind behind us when we're up high. This we do. We speculate what purpose the track could serve, but it is helpful underfoot. 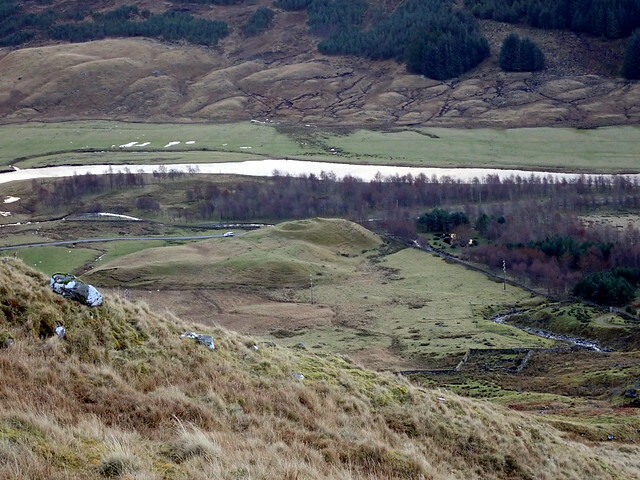 At the end of the track, a soggy ATV trail leads up into Coire Uaimh - we follow this - indeed we are able to take advantage of various ATV tracks during the day, most notably from the final Simm up to Buidhe itself. 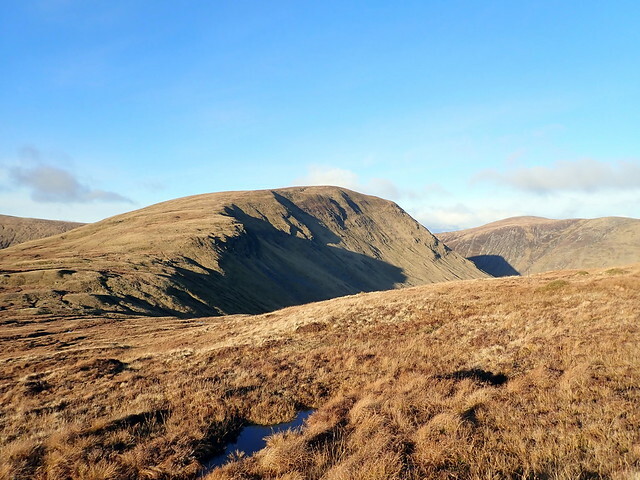 We eventually rise out of the coire and pass Meall Cruinn, heading for the furthest away Simm, Creag Riabhach. 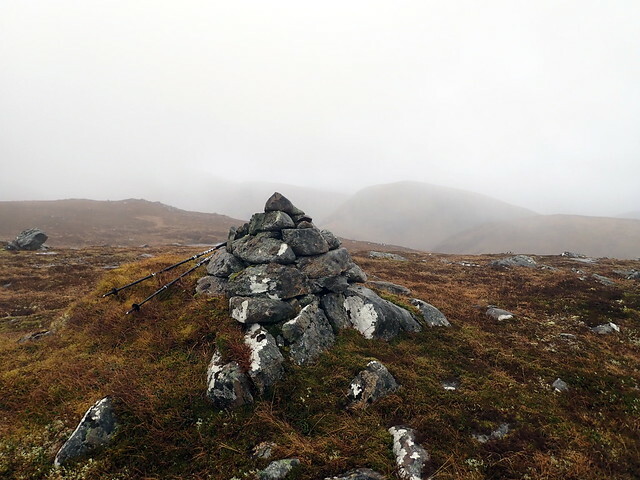 Mist covers then reveals the hillside, feet splosh through peat bogs, the summit (with two cairns) is achieved and we stop in the lee of a boulder on the way back down to have our lunch. 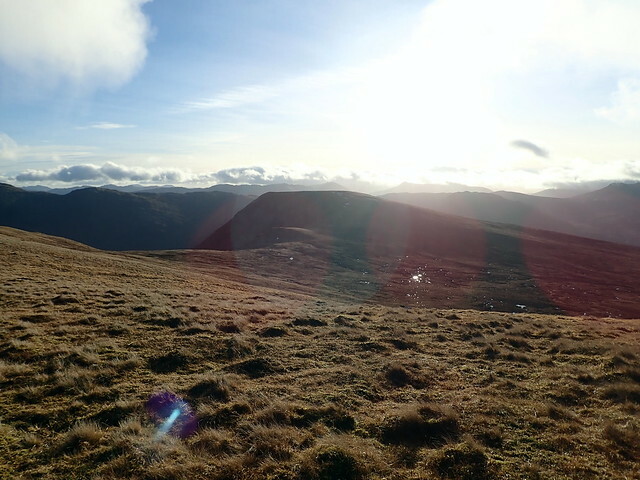 Then back up and to the summit of Meall Cruinn. 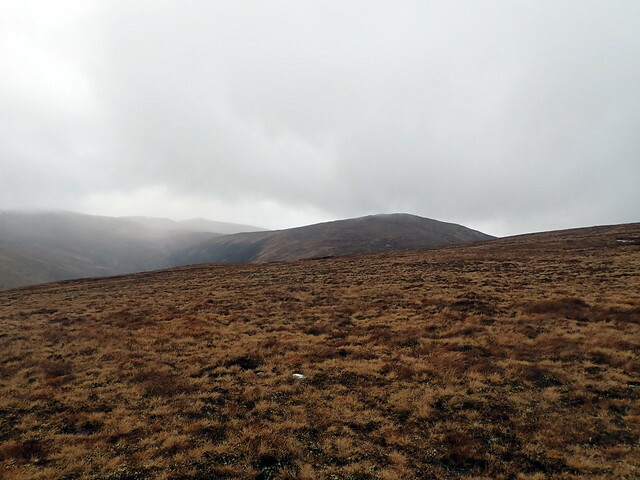 A longish trackless yomp through bog and heather takes us to Meall nan Aighean (and I notice now that we missed a further Simm, Carabad, some 3 km north of here - though frankly I wouldn't want to have added 6km more to the day). 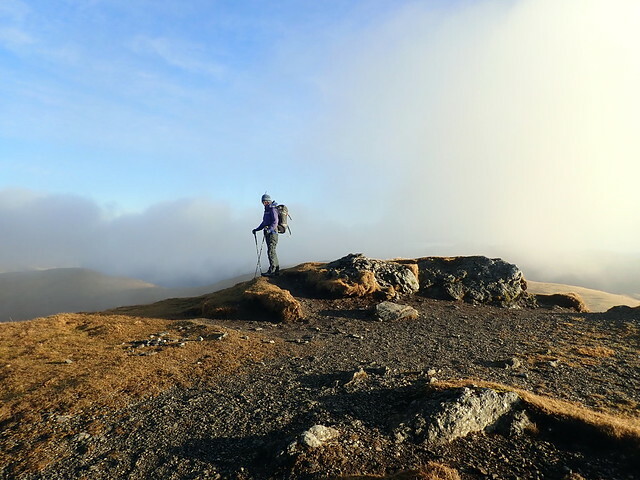 Then over to the featureless lump of Meall Buidhe's west top, where we pick up an ATV track again that leads us steadily to the summit of Meall Buidhe, a couple of kilometres distant. 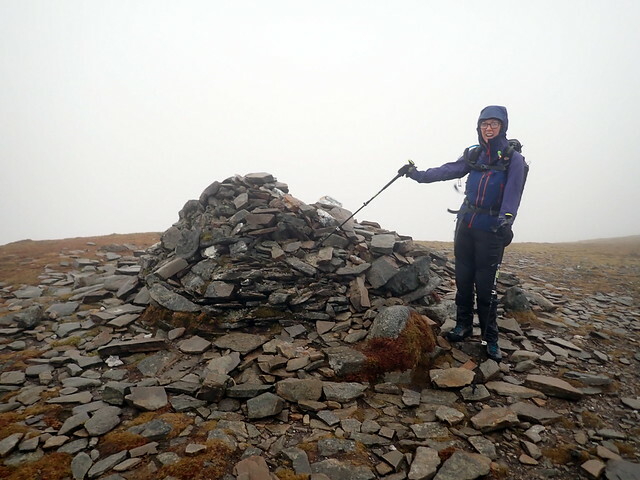 The wind is whipping up a storm at the summit - we are blasted and buffeted as we return south towards Meall a'Phuill and the standard descent route. 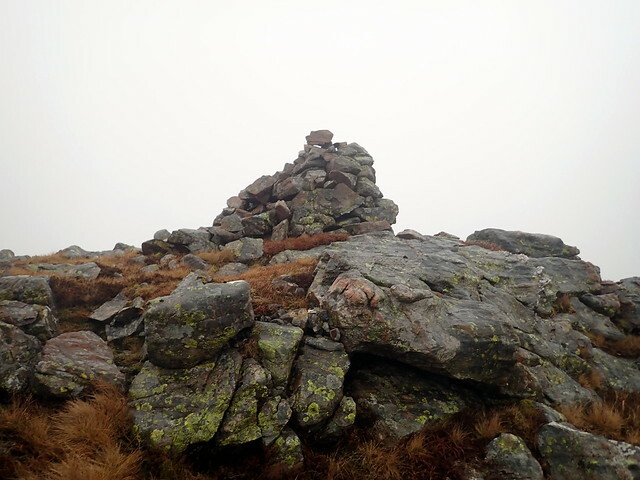 We pass a party of three on their way to the summit, huddled round at the 917m cairn looking which way to go. The mist clears as we descend and we make it back to the car in just under six hours. The drizzle continues on the journey home, which is impossibly slow down Loch Lomondside due to a snaking line of traffic, but the temperature remains elevated - 11 degrees as we near Glasgow.